It’s pretty much official that this is my summer of kayaking. This afternoon I’ll be heading out on the ocean once again to paddle through waves with the MEC Big Chop Summer Paddle Series. 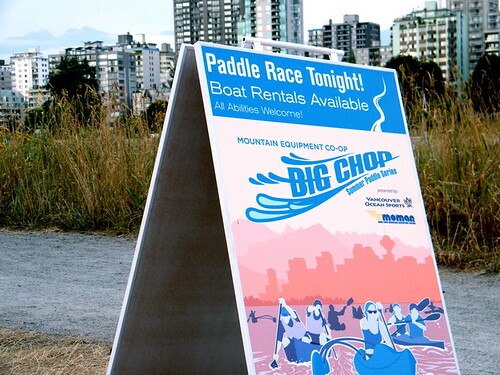 The Big Chop is a 10 race series happening Thursday evenings this summer, starting out in Vanier Park on the shores of False Creek. You can drop in as a racer for $10 or purchase a series pass, but simply show up on race day to register on the spot, hop into your boat (or onto your paddleboard) and you’re all set. It’s a great way to get out and enjoy the water, and also a fantastic day to wind down after a long shift at work. The race is open to OC 1 & 2, kayaks, paddleboards, canoes, and many types of boat rentals are available on-site in case you cannot bring your own. 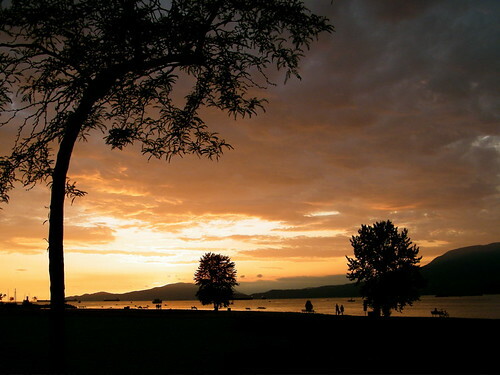 Advanced booking for the rentals is recommended so you can do so by sending an email text message to (604) 999-3331 with your details and preferences (boat details can be found online). There’s a Big Chop race (8km) and a Little Chop (4km), and after each race there is a an awards ceremony as well where prizes are handed out. Results are always posted online and each overall winner is entered into a draw for the grand prize, which will be awarded at the end of the summer series. There is also plenty of time to hang out afterward as they also host a post-race BBQ with drinks and snacks for all racers. Upcoming race dates are August 6th, August 20th, September 3rd, and even tonight if you can stop by. I’ll be there early for a quick paddle but not to participate in the race. I’ll be watching that from the shoreline as it’ll be pretty cool to see hundreds take to the water for this event. Update: I totally lied, I DID race in the Little Chop event this evening. My friend Tanya and I took in the kayaking clinic and I learned even more useful skills out on the water. After that we saddled up in a double kayak and attempted to do the Little Chop (about 1/2 as long as the Big Chop in English Bay). We decided to take it easy and had such a great time out on the water. Returning to shore everyone was so friendly and in such a great mood (the BBQ and snacks also helped). Once the Big Chop participants rolled in they announced the race results and proceeded to give away at least a dozen raffle door prizes. To think, for under $20 you can get lessons, participate in a kayak race, enjoy a hot dog, and potentially win some amazing swag from the sponsors. Tanya ended up with a swanky visor and I had my eye on a dry bag from MEC as that’s the one thing I always need when out kayaking. To top off an amazing evening out on the water, we enjoyed watching the sun cascade across the water and tuck itself behind the moutains as it set. There are only a few Big Chop races left this season before the series championship and after party but there’s always time to sign up either in advance or on the day of the event. Thanks for reminding me about this event. I got MEC’s newsletter email regarding this last year and still haven’t made it out! Perhaps this year will be my ‘Big Chop’ year.